July 2013 remains to be fresh on the minds of coffee farmers in the Kolahun District area because that was the time in post war period we first heard of a market to be provided for our coffee crops. Gail and John broke the news that Compassion Corps was ready to buy our coffee for a good price. This news was received in skepticism because for a very long time no one or no organization had told us such. At that time, many coffee farms had been abandoned or turned into either rice or cocoa farms. Prior to the start of the Liberian civil war in 1989, coffee was the main source of financial income; children were sent to school, homes built, medical care, all from the proceeds from the sale of coffee. But after the war ended, we did not have anyone coming to buy coffee. People sometimes carried coffee to Guinea but were exploited and so everyone then abandoned the farms. The good news from Compassion Corps made some farmers begin to work on their farms to prepare for the harvest period, although still doubting whether Compassion Corps would come to buy their crops. 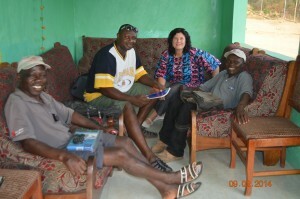 John, Emmanuel, and I continued to make follow ups with the farmers, keeping their hope alive. The first year of buying coffee after the civil war coincided with the festive month of December, at which time all parents desire the best of everything for their families. Compassion Corps lived up to their promise and sent funds to begin buying our coffee crops. I wish everyone could have been here to see and feel the excitement from the farmers. Some farmers even forced their way to harvest coffee in the thick bush. Enough of our coffee was bought by Compassion Corps. 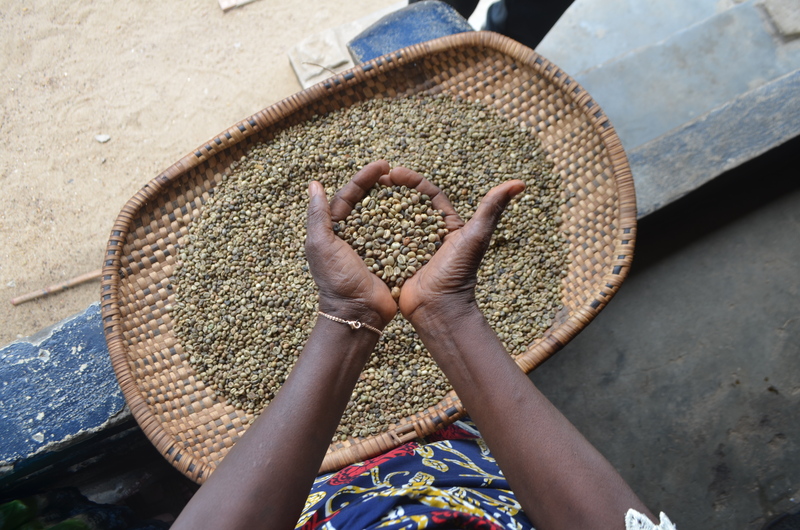 The process even provided some livelihood for many people-women were hired to clean and sort coffee; men were also hired to do weighing, sewing of coffee bags, packing of bags in the warehouse, and loading and unloading trucks. From my own assessment, following the intervention of Compassion Corps by providing a suitable market for coffee products, many parents were able to send their children to school the following school year. I heard a parent say, “If it were not for my coffee farm, there would be no way for my children to go school.” That brought joy to my heart! In addition to school affairs, many farmers were seen cleaning their farms, while some were rehabilitating their old farms, and at the same time some farmers started replanting new farms (to cultivate the Liberica variety). The second year of buying was widely interrupted by the just-ended Ebola epidemic. Notwithstanding, many farmers harvested plenty of coffee to sell to Compassion Corps, but it all started on a difficult note. 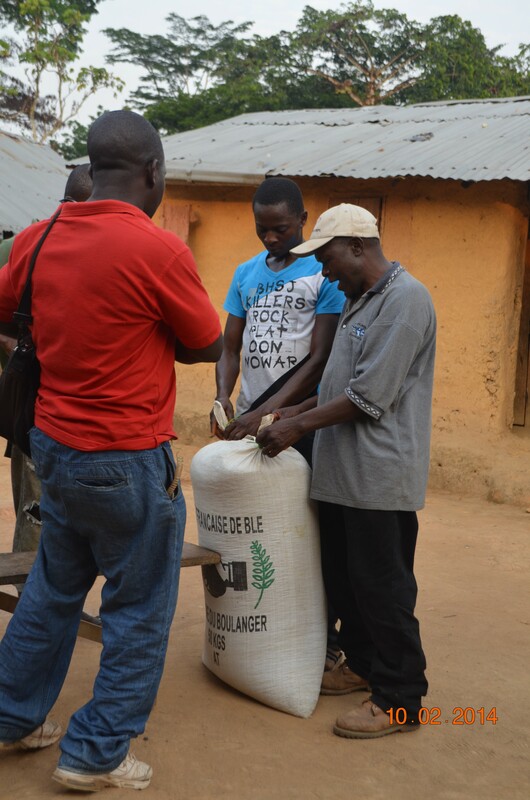 When John came for us to start buying in December 2014, interacting with farmers (closely) was a difficult problem. There were lots of travel restrictions and health safety measures to follow… However, we managed to commence the buying. But the excitement and joy of the farmers was short lived when we announced that Compassion Corps was temporarily suspending buying due to shortage of funds to buy coffee. Up to date, farmers are still calling and asking as to when we will move in to buy their coffee? Other buyers later moved in to buy coffee but because they are not offering a fair price, most of the farmers are holding fast to their coffee, expecting Compassion Corps to come and buy. 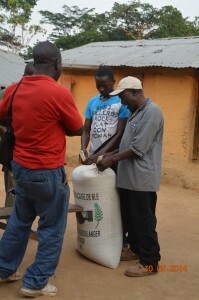 RECENT UPDATE: CEO, Jan Bean, is currently (Jan 2016) in Liberia, continuing to work on obtaining funding for the coffee enterprise and making connections to continue to facilitate a stable market in the now Ebola-free country. In July and August, a 21 member team visited Compassion Corps’ partners in Uganda. The team spent a week in the northern town of Lira, a week in the western area of Kilembe Mines, and a few days in the town of Entebbe. One of the moments of this trip that has stuck with me happened on the third day in Kilembe Mines. After a few days of running a clinic there and also getting to know the children and the people, we were saying all of our goodbyes and also leaving behind medicine for the community. 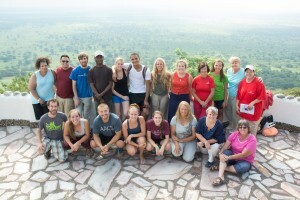 A lot of things were done at Kilembe including Compassion Corps aiding the coffee business there. The director of the school, Lucy, was saying goodbye and she said “Who are we, as the people of Kilembe, to deserve this? 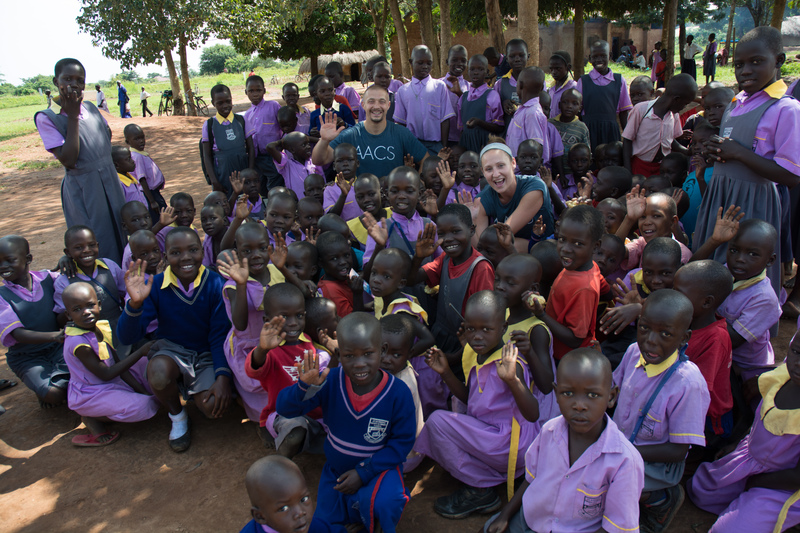 Why us of all the people of Uganda?” It was so amazing and humbling to see that these people, who worked so hard for the little they have compared to us (in America), were so unbelievably grateful for the little that we gave them. They were so thankful for the love, the care and the time we gave to them even though in reality, there was only so much we could give them in the short time. It was so neat to see such beautiful and thankful hearts. Serving alongside my wife and two of my sisters. 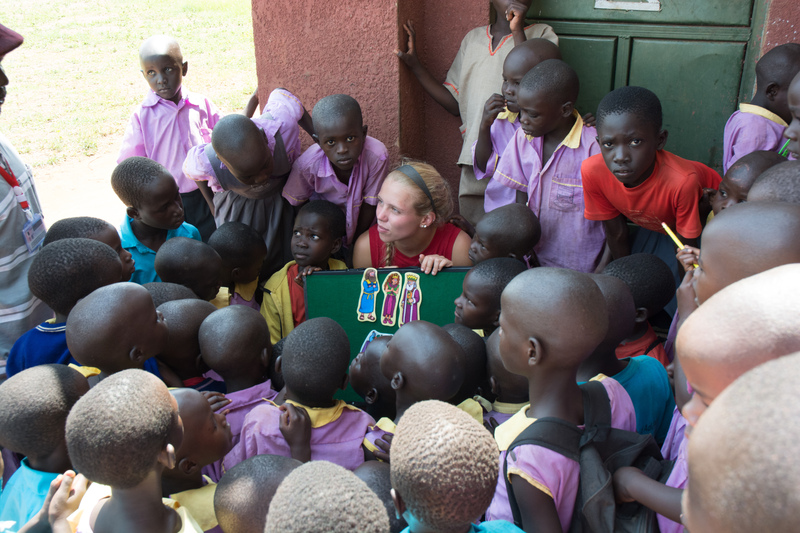 Sharing the truth of the gospel with the people in Uganda. Seeing the joy the Ugandan people have. Playing futball with and against the youth. Coaching a “ManU v Arsenal” match with the elementary kids in Kilembe Mines. Young boy jumped into my arms after our team scored a goal…he was so hyped. So many funny stories shared with our team members and great memories made serving together. they greeted us were incredible. That church service was, what I would call, “poppin”!! We walked in and the people were singing “Hallelujah to the Living God” and dancing. I was so happy to be in church. I jumped and danced and sang all for the praise of God and it just felt great. After that, for the first time ever, I got a chance to minister and speak about the word of God in a classroom full of young children as well as to the middle aged kids after soccer drills. And this was all just in the first couple of days. The progress that I made in my walk with God was awesome. The biggest impression for me from the trip is how awesome we were as a team…each one doing their part….eagerly, pleasantly and without complaining. It reminds me of the passage from the Apostle Paul about the whole body and how each part of the body is necessary to make the body function. My next highlight is how much of a witness of Christ’s love we were to our partners and others as we served them and tried to help meet some of their needs graciously and lovingly. This was evidenced by each team member I thought, but especially the students or younger ones on the team. Another great impression I had was how beautiful the people we met and served were and how beautiful the country of Uganda is ( reminded me a lot like Hawaii)!!! Also, I remember (not so much a pleasant highlight, but laughable now), the very long, bumpy trips we made in the bus/van from one area of service to another! During one of our clinic days in Lira, several of us were planning to sneak out (the docs, nurses, and pharmacy people had it all under control) and go over to the secondary school across the road, behind the church to run a soccer (or futball) clinic for the kids there. The days prior to that, we had been spending the afternoons playing games and doing Bible lessons with the elementary kids right there at the church school, but on this particular day, we really wanted to get over to the older kids and be able to share an afternoon with them as well. We had all our well intentioned plans – we knew about how many students we’d be working with, so we split up our team into different stations so we could each run one drill and we’d have the kids rotate around, so everyone would get to participate in each drill one time. The whole rotation required 5 of us helping – check! We needed certain equipment for each station – check! The process would take about an hour and half total and we had just that amount of time before our team’s van would be pulling out at the end of the day – check! But…like many times in Uganda, our perfectly planned event was challenged and forced to morph into something different right on the spot. I guess we thought it would be so simple to walk right past the hundreds of elementary children we’d been playing for the past two days and expect them to stay put on their school grounds while we paraded bags of balls, pinnies, cones, and all sorts of fun looking soccer supplies right by them on our way to play with the big kids. Boy, were we wrong. Their teachers even tried to help keep them on their own playground area while we made our way over, but soon enough, the flood gates broke loose and as we looked behind us, we saw that masses of beautiful bright eyes in matching school uniforms were marching along, excited to join in the fun. This organized soccer clinic for what we thought would be 100 high school kids (turned out there were more students there when we got there anyway) just turned into a massive “play day” for about 400 K-12th graders. Wow. Wasn’t prepared for that. Thankfully, our team had brought several suitcase full of crafts and games, so we ran back for more supplies and somehow the 5 of us managed the mayhem (it was joyful mayhem, but mayhem none the less) without any major mental breakdowns from those of us with type A personalities and without any injuries to the hundreds of children running around in bare feet, looking like they were having the time of their lives. At one point, I looked up and just took in the scene – some groups of younger kids were throwing frisbees, chasing kickballs or jumping rope… others were gathered around one of our girls, coloring pictures or making yarn bracelets, and the older kids were loving their soccer drills, rotating whenever the barely audible whistle blew. 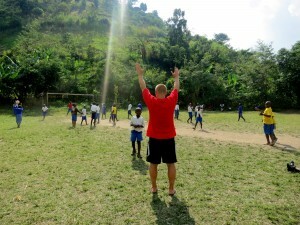 I was thankful for the experience, for our team’s flexibility and for the persistence of those little Ugandan cuties. They would not be denied. And why should they have stayed behind when that kind of wild fun was waiting just across the way? 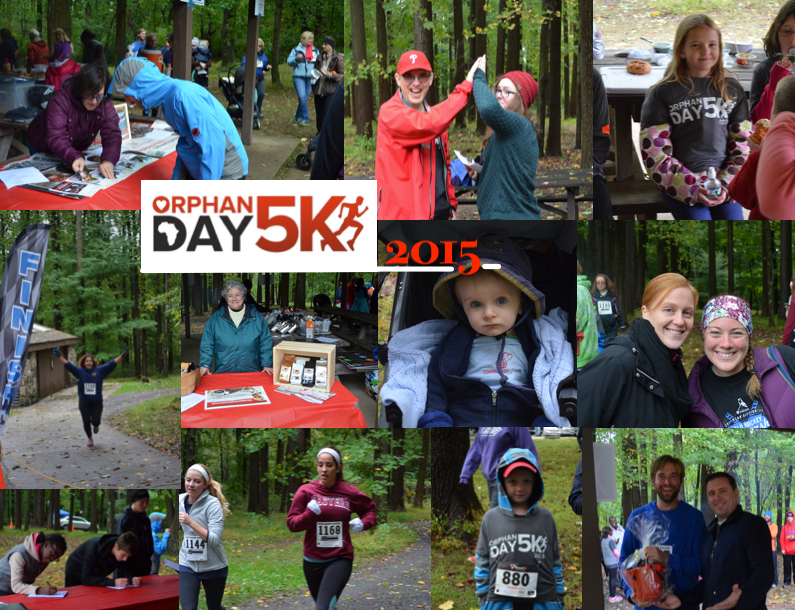 We were able to raise over $5,500 this year at our 5th annual Orphan Day 5K! 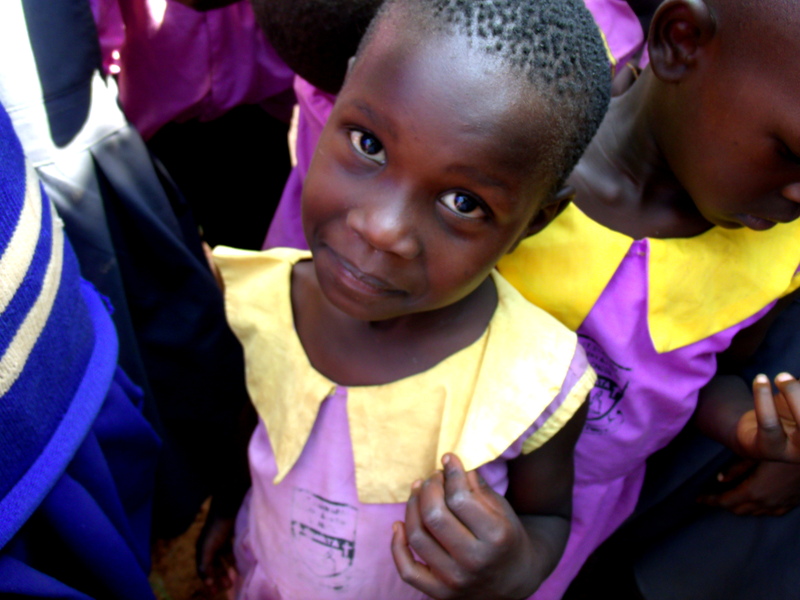 Funds are going toward student sponsorships for children in Liberia and Uganda. 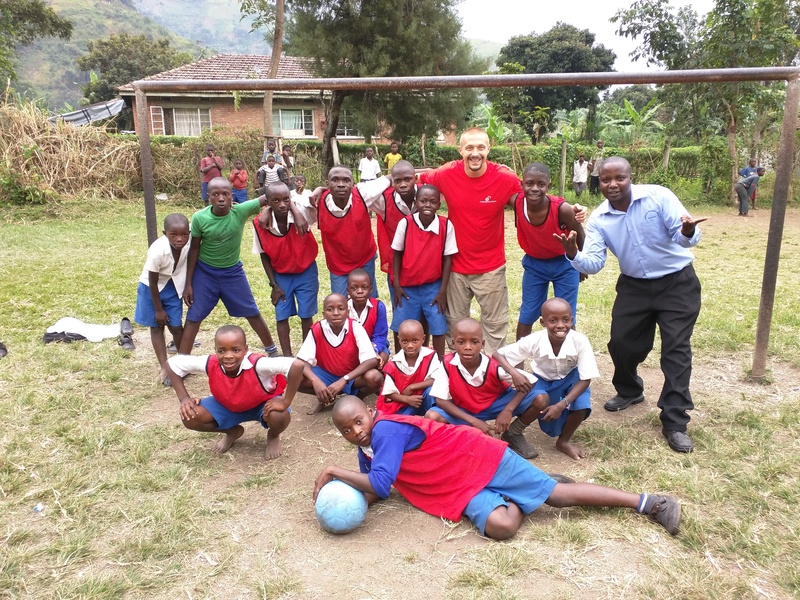 In fact, as a direct result of this fundraising effort, tuition fees have already been sent to three different partner schools to help keep dozens of students in class! 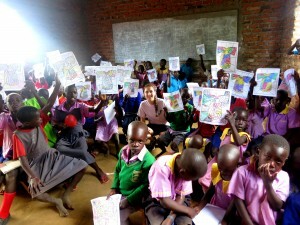 These precious kids have the opportunity for a brighter future because of your efforts. THANK YOU!